Tuesday October 23, 2018: JJ is suspicious of Gabi, Sami rescues the man thought to be EJ and Abigail's angry with Chad. At Kate’s suite at Salem Inn, Gabi is anxious for Kate to fill her in on what transpired between Abigail and Chad. Kate looks unenthusiastic but admits she told them all, including Stefan, that Gabby attacked Gabi. Gabi grins, happy they nailed it. Kate’s dismayed that Chad’s heart is now br oken. She’s no fan of Abigail but knows she worked hard to become healthy for her family and Chad loves her. Gabi hisses. “Don’t go soft on me now,” she says, reminding Kate that Abs killed Andre and that she almost died in prison. Kate is sorry for what happened to Gabi but counters that Abigail was ill. Gabi plans to take over Abigail’s life and raise her baby once she’s committed. 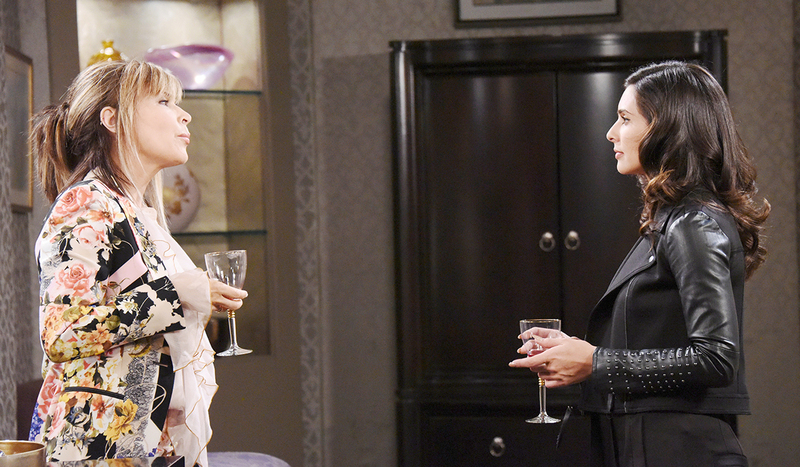 They drink wine as Kate admits she does think Gabi’s better for Chad than Abigail. 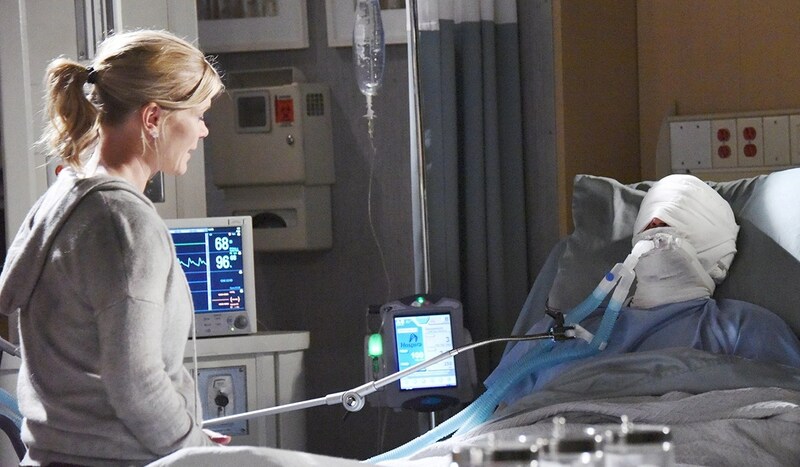 Gabi’s glad because she wants her to go to the hospital to ensure Chad got Abby examined. Kate refuses so Gabi blackmails her into it. From the Kiriakis house, Sonny takes a call from Will who is curious as to how Arianna is. Sonny says she wants drum lessons. “Lucky us,” Will says. Paul wheels himself out as Will admits, “I also wanted to hear your voice.” He sees Paul and ends the call. Paul frowns. Will’s surprised Paul didn’t ask for help dressing. Paul wants his independence and frozen yoghurt. In Tennessee, Brady and Eric are thrown a few feet after Xander’s warehouse explodes. Eric calls out Nicole’s name. Sami and the mystery patient approach and there’s another explosion. Eric screams and Sami sobs, holding her brother back. Firefighters arrive, and Brady tells them they’re fine and that Holly’s across the street with some shopkeeper. She may have smoke inhalation. At the square, Will and Paul talk about going for long drives and Paul says next spring he’ll be at every baseball game. Will thinks Paul will be walking before then. Paul’s grateful for his positive outlook. He’s sorry he hasn’t been that supportive of Will’s familial issues as of late. Will hasn’t heard from his mom in a few days. Paul’s confused. That’s who he thought Will was talking to, earlier. Will admits he was talking to Sonny. Sonny walks up and lies that Will was talking to Ari. Paul laughs, relieved. Sonny says Paul looks great. Paul credits Will for being able to see a future for himself. Sonny smiles, saying Will’s ‘totally in love’ with Paul. Sonny regales them with stories of Susan living with his Uncle Vic and the trio laughs at how she livens things up. He asks if there’s room at Martin House for her. Paul says they’re moving in together so she might be able to have one of their rooms. Sonny’s stunned to hear but tries to cover his pain and congratulates them. They leave and Will returns to find something he lost. He finds Sonny and thanks him for covering him for the phone call. They reveal how much they miss one another. In the hospital waiting room, Brady, Sami and Eric wait for Holly to be seen by the doctor. Eric starts in on Brady teaming up with Kristen. Brady explains he was playing the DiMera and Sami defends their brother. Eric roars that if Nicole’s dead it’s Brady’s fault. They argue until Sami asks Brady to leave them alone for a while. Once Brady’s gone, Eric has a meltdown. The twins cry together, and Sami says she’s glad Brady got him out. She couldn’t bear to lose him. They talk about the mystery patient and Sami thinks he’s EJ and shares that Rolf’s alive. They can’t figure out if EJ got the wrong dosage of the bring-back-the-dead serum since Will is thriving. Eric forces Sami to go be with the patient. They tearfully embrace and Sami goes to the patient’s room to sit with him. She says his name. Elsewhere, Brady returns and hears Eric deep in prayer. Brady and the Fire Chief, (played by Byron McIntyre) tells Eric there were no survivors, but they found the necklace Eric gave Nicole. Eric sobs. Nearby, Chad and Abby wait for a doctor while Kate walks up and Abby immediately asks why she made up that story about her. Gabi’s back at the Kiriakis house. She looks for “Aspirin” but finds the drugs she gave Abigail instead. She doesn’t want to fall asleep so toddles off to find something weaker. JJ arrives and calls Gabi’s name. When she doesn’t come, he searches her purse. Sheila and Abe have it out again.